Department of Botany, Laboratory of Plant Pathology and Biochemistry, University of Rajasthan, Jaipur - 302004, Rajasthan, India. ABSTRACT: Plants are an important source for the discovery of new products of medicinal value for drug development and plants secondary metabolites are unique sources for pharmaceuticals food additives, flavors, and other industrial values. The commercial importance of these secondary metabolites has resulted in a great interest in its production and in exploring possibilities of enhancing its production using tissue culture technology in recent years. A good number of abstracts and research articles published, so far, for evaluating antioxidant, the anti-microbial and anti-diabetic activity of different secondary metabolites which have been extracted from various plants. In this article, we reviewed bioactivity of flavonoids, alkaloids, and phytosterols of total 18 different plants. Out of which, total of 10 plants were found to show antioxidant potential, 9 plants were found to show anti-microbial potential, and 9 plants were found to show the anti-diabetic potential of secondary metabolites. Root, stem, leaves, fruits, and flowers of various plants were found to possess secondary metabolites to show bioactivity. So this article will be a comprehensive ready reference for those who are interested in antioxidant, anti-diabetic and antimicrobial of secondary metabolites. Secondary metabolites, Antioxidant, Antimicrobial, Anti-diabetic, Flavonoids, etc. INTRODUCTION: Throughout the ages, a human has relied on nature for their basic needs, for the production of food, shelter, clothing, transportation, fertilizers, flavors, fragrances and medicines. Plants play an important role in conventional as well as western medicines. The importance of using medicinal plants can be attributed to some reasons, including affordability and limited availability of western medicine as well as the trust in herbal medicine is due to positive results when applying herbs. Recently, there has been a shift in universal trend from synthetic to herbal medicine, which can be said “return to nature.” Plant-derived drugs have been a part of the evolution of human, healthcare for thousands of years. According to the Worlds Health Organization, any plant which contains a substance that can be used for therapeutic purposes or which are precursors of chemo pharmaceutical semi-synthetic new drug is referred to as medicinal plants 1. Nature has been a source of medicinal agents for thousands of years. Folk medicines of almost all civilizations of the world abound in herbal remedies. Majority of the traditional medicines used in healthcare are obtained from plants. In spite of several advancements in the field of synthetic drug chemistry and antibiotics, plants continue to be one of the major raw materials for drugs treating various human ailments. Clinical and pharmaceutical investigations have elevated the status of medicinal plants by identifying the role of active principles present in them and elaborating on their mode of action in human and animal systems. A medicinal plant is defined as any plant which has compounds that can be used for the therapeutic purpose or which contain precursors of chemo-pharmaceutical synthesis. Throughout the world, plants are used traditionally to treat many ailments, particularly infectious diseases, such as diarrhea, fever, cold as well as for birth control and dental hygiene. Also, many psychoactive substances used in traditional medicine are of plant origin. Traditionally used medicinal plants produce a variety of known therapeutic properties 2. Herbal Medicine is still the mainstay of health care in several developing countries. The widespread use of herbal remedies and health care preparations, as those described in ancient texts such as the Vedas, and are obtained from commonly used traditional herbs and medicinal plants, have been traced for the occurrence of natural products with medicinal properties. Some interesting outcomes have been found with the use of a mixture of natural products to treat diseases, most notably the synergistic effects and poly-pharmacological application of plant extracts 3. In India, thousands of species of plants are known to have medicinal value and the use of different parts of several medicinal plants to cure specific ailments has been in vogue since ancient times. Purohit and Vyas reckon that about 70,000 species of the plant kingdom have been used as herbal medicine at one or other time. Ayurveda is the science of life, prevention, and longevity. It is the oldest (over 5000 years) and most holistic medical system available today. This system traces its origins to the Vedas, Atharvaveda in particular. Ayurveda or Ayurvedic medicine is a system of traditional medicine, which is native to India and form an alternative system of medicine. The earliest literature on Indian medical practice appeared during the Vedic period in India. In Ayurveda, some indigenous plants having medicinal value are documented. The Susruta Samhita and the Charaka Samhita contain influential works on traditional medicine during this era, and more than 700 plants are listed in this literature. Over the following centuries, Ayurvedic practitioners developed some medicinal preparations and surgical procedures for the treatment of various ailments 4. Today, the world is gradually turning to herbal formulations which are known to be effective against a large repertoire of diseases and ailments. More importantly, they are not known to cause any notable derogatory effects and are readily available at affordable prices. In developing countries, synthetic drugs are not only expensive and inadequate for the treatment of diseases but are also often with adulterations and side effects. Hence, different remedies evolved in different regions of the world 5. The World Health Organization has reported that more than 80% of the world’s population in developing countries depends primarily on herbal medicine for basic healthcare needs. Hence, there is a need to search for plants of medicinal value. In recent years, the traditional system of medicine has become a topic of global discussion. Many of the plant species recognized as medicinal herbs have been scientifically evaluated for their possible medicinal applications. It has been mentioned that natural habitats for medicinal plants are disappearing fast and together with environmental and geopolitical instabilities; it is increasingly difficult to acquire plant-derived compounds. This has prompted industries, as well as scientists to consider the possibilities of an investigation into cell cultures as an alternative supplement for the production of plant pharmaceuticals. Phyto-compounds are known to play a major role in the adaptation of plants to their environment, but also represent an important source of pharmaceuticals 6. The use of plants and their extract for the preparation of herbal drugs provides the foundation to modern therapeutic sciences and thus enabled the man to establish the empirical system of medicine. Hence, several plant species are being screened for these herbal compounds and are also isolated from the plants. In this review, we have explored the antioxidant, anti-microbial and anti-diabetic activity of some secondary metabolites of various plants. Secondary Metabolites: Metabolites are the intermediates and products of metabolism. The term metabolite is usually restricted to small molecules. Metabolites have various functions, including fuel, structure, signaling, stimulatory and inhibitory effects on enzymes, the catalytic activity of their own (usually as a cofactor to an enzyme), defense and interaction with other microorganisms. Plants produce a vast and diverse assortment of organic compounds the great majority of which do not appear to participate directly in growth and development. These substances traditionally referred to as secondary metabolites, often are differentially distributed among limited taxonomic groups within the plant kingdom. The evolving commercial importance of secondary metabolites has in recent years resulted in a great interest particularly in the possibility of altering the production of bioactive plant metabolites using tissue culture technology. Plant cell and tissue culture technology can be established routinely under sterile conditions from explants, such as leaves, stem, roots, and meristems for both the ways for multiplication and extraction of secondary metabolites. In-vitro production of secondary metabolites in plant cell suspension cultures has been reported from commercial and medicinal plants. Unlike primary metabolites, the absence of secondary metabolites does not result in immediate death, but rather in long-term impairment of the organism’s survivability, fecundity, or aesthetics, or perhaps in no significant change at all. These are often restricted to a narrow set of species within a phylogenetic group. These also play an important role in plant defense against herbivory and other interspecies defense. Secondary metabolites are a wide range of active compounds and are biosynthetically derived from primary metabolites. They are more limited in their distribution in the plant kingdom. They vary in quality and quantity for a given plant species growing in different locations. They are frequently accumulated in smaller quantities tend to be synthesized by specialized cell types at distinct developmental stages. The medicinal plants are rich in secondary metabolites, a diverse group of chemicals, which include alkaloids, glycosides, amines, insecticides, steroids, flavonoids, and related metabolites, which have been extensively used in drug and pharmaceutical industry 7. Many of the plant secondary metabolites are constitutive, exist in healthy plants in their biologically active forms, but others occur as inactive precursors and are activated in response to tissue damage or pathogen attack. The beneficial medicinal effects of plant materials typically result from the combinations of secondary products present in the plant such as alkaloids, steroids, tannins, flavonoids, resins, fatty acids, etc. Out of the total number of secondary metabolites reported in the dictionary of natural products, 33,000 are terpenoids, 16,000 alkaloids, and 8,182 flavonoids. These being an integral part of the basic metabolism also have an ecological role and are often involved in plant protection against biotic or abiotic stresses 8. Some secondary metabolites such as flavonoids are also involved in cell pigmentation in flower and seed, which attract pollinators, seed dispersers and are also involved in plant reproduction. Moreover, plant secondary metabolites have pharmaceutical properties effective for human health. Plants secondary metabolites are usually classified according to their biosynthetic pathways. They are classified into four large molecule families: flavonoids, steroids, and alkaloids. 1. Alkaloids: Alkaloids are heterocyclic nitrogen compounds. The primary metabolites from which they are derived include amino acids such as tryptophan, tyrosine, and lysine. Alkaloid biosynthesis pathways can be long, and many alkaloids have correspondingly complex chemical structures. Alkaloids have a 3000 years golden history in human medicinal use as purgative, antitussive and sedatives in snakebite, fever, and insanity. Alkaloids are a group of naturally occurring chemical compounds. They are widely distributed, and about 5500 alkaloids are known, comprising the largest single class of secondary plant metabolites. They are known to have pharma-cological effects and are used in medication, as recreational drugs, and in entheogenic rituals. A benzylisoquinoline alkaloid, papaverine has shown to have an inhibitory effect on several viruses and indoquinoline alkaloids from Cryptolepsis sanguinolenta displayed activity against some gram-negative bacteria and yeast. Quinine, an alkaloid, is popular for its antimalarial activity against the malaria parasite. Literature indicates that plant alkaloids have considerable biological activity 9. Many alkaloids are also toxic to other organisms. As secondary metabolites, alkaloids are thought to play a defensive role in the plant against herbivores and pathogens. Due to their potent biological activity, approximately 12000 known alkaloids have been exploited as pharmaceuticals, stimulants, narcotics and poisons. The use of alkaloid-containing plants as dyes, species, drugs or poisons can be traced back almost to the beginning of civilization. 2. Flavonoids: Flavonoids are a group of polyphenolic compounds. They are ubiquitous in photosynthesizing cells and are commonly found in fruits, vegetables, nuts, seeds, stems, flowers, tea, wine, propolis, and honey. They are known to have medicinal properties and play a major role in the successful medical treatments from ancient times, and their use has persevered till date. They are potent water-soluble antioxidants and free radical scavengers, which prevent oxidative cell damage and have strong anti-cancer activity. They are used to improve aquaresis and as anti-inflammatory, antispasmodic, and anti-allergic, antimicrobial agents 10. It was reported that flavonoids could improve the blood circulation and lower the blood pressure. Flavonoids also have a biochemical effect, which inhibits some enzymes such as aldose reductase, xanthine oxidase, phosphodiesterase, ATPase, lipoxygenase, cyclooxygenase, etc. they also have a regulatory role on different hormones like estrogens, androgens, and thyroid hormone. They have been found to have anti-inflammatory activity in both proliferative and exudative phases of inflammation. In plants, flavonoids have long been known to be synthesized in particular sites and are responsible for color, aroma of flowers, fruit to attract pollinators consequently fruit dispersion, help in seed, spore germination, growth and development of seedling. Flavonoids protect plants from different biotic and abiotic stress and act as unique UV- filter, function as signal molecules, allelopathic compounds, phytoalexins, detoxifying agents, antimicrobial defensive compounds. 3. Phytosterols: Sterols comprise several major groups of steroids characterized by having a hydroxyl group at C-3, normally in the beta configuration and branching side chains from eight to ten or more carbon atoms at C-17. They occur widely throughout the animal and particularly the plant kingdoms. They have both structural roles, as membrane constituents, and a key place in the biosynthetic sequences which lead to the steroidal species. The sterols are the starting material for biosynthesis of plants. The phytosterols, known to be universally present in higher plants are the starting materials for the biosynthesis of plant steroids. They cannot be synthesized by human and are thus consumed from the diet. They have decreased serum cholesterol level as reported in several studies. Plant sterols are industrially important chemical sources for steroid compounds, insecticides, antioxidant and anticancer drugs. A summary of some of the sterols, isolated from various plants has been reported. The most often isolated sterols from higher plants is β-sitosterol, β-stigmasterol, lanosterol and campesterol are also quite common. A similar finding was also reported by some other workers with β-sitosterol, campesterol and stigmasterol as most often isolated compounds from higher plants. Evidence suggests that phytosterols possess antioxidant activity, anti-inflammatory activity, anti-cancer activity against cancer of lungs, stomach, ovary, and estrogen-dependent human breast cancer 11. 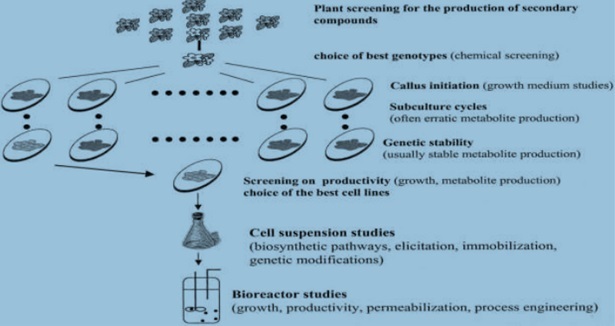 Production of Secondary Metabolites and Recent Improvements of Production Process: Plant secondary metabolites are unique resources for pharmaceuticals, food additives, and fine chemicals. They also provide original materials used in other areas. Besides direct extraction from plants, and chemical synthesis to provide those compounds or derivatives with similar uses, plant cell culture has been developed as a promising alternative for producing metabolites that are difficult to be obtained by chemical synthesis or plant extraction. 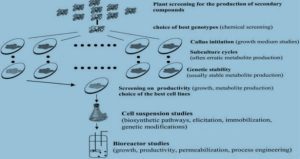 However, in spite of decades of efforts, production of plant secondary metabolites by plant cell culture technology is still facing many biological and biotechnological limitations. One of the major obstacles is the low yield of secondary plant metabolites in plant cell cultures. Since the major roles of plant secondary metabolites are to protect plants from attack by insect, herbivores, and pathogens, or to survive other biotic and abiotic stresses, some strategies for culture production of the metabolites based on this principle have been developed to improve the yield of such plant secondary metabolites and they include treatment with various elicitors, signal compounds, and a biotic stresses. Many such treatments indeed effectively promote the production of a wide range of secondary plant metabolites, both in-vivo and in-vitro. However, productivity is still rarely competitive for industrial application. 1) Manipulation of plant cell cultures to improve productivity of target compounds, through improving chemical processing and bioreactor performance or employing elicitors, abiotic stresses, and other approaches, regardless of their mechanisms; 2) Studying signal transduction pathways underlying various effective strategies leading to biosynthesis of target secondary metabolites; 3) Studying transcription factors and their regulation mechanisms, including genetic manipulation of regulator genes to improve the production of target secondary metabolites; 4) Cloning of secondary metabolite biosynthetic genes, and genetic modification of key genes to engineer the metabolic flux to target compounds; 5) Studying metabolic flux and profiling metabolic intermediates to understand whole pathways and overall regulation of target compound accumulation; and 6) Studying gene transcripts for plant secondary metabolism by profiling and analyzing global gene expression under different conditions to understand the regulation of plant secondary metabolism in a whole sense. Plant cell culture is able to produce secondary metabolites came quite late in the history of in-vitro techniques. It had been considered for a long time that undifferentiated cells, such as a callus or cell suspension cultures were not able to produce secondary compounds, unlike differentiated cells or specialized organs. Zenk and co-workers experimentally demonstrated that this theory was wrong, as they could observe dedifferentiated cell culture of Morinda citrifolia yielding 2.5 g of anthraquinones per liter of medium. This finding opened the door to a large community of vitro culturists who extensively studied the possible use of plant cultures for the production of secondary compounds of industrial interest, and the possible use of plant cell cultures for the specific biotransformation of natural compounds have been demonstrated 12. 1. Antioxidant Activity: Antioxidants have been reported to prevent oxidative damage caused by free radicals. All organisms are protected from free radical attack by defense mechanisms that scavenge and stabilize free radicals but when the production rate of free radicals exceeds oxidative stress generates, a deleterious process that can damage cell structures, including lipids, proteins, and DNA. For the prevention and treatment of disease of disease, whose mechanisms involves the process of oxidative stress, many antioxidant based drug formulation is used. Because of restriction on synthetic antioxidants due to their carcinogenicity, interest has increased considerably in finding naturally occurring antioxidants for use in foods, cosmetics or medicine materials to replace the synthetic ones. There are some speculations that the number of medicinal plants produced natural antioxidants can neutralize free radicals inside the body. Therefore, the great interest has been recently focussing on the natural foods, own medicinal abilities to scavenge free radicals. Due to this fact, considerable interest has been shown to the addition of natural based antioxidants in food and biological-based systems of scavenging free radicals. They may provide a safe replacement for toxic and harmful synthetic antioxidants. (i) Limonia acidissima: The preliminary studies of the Limonia shows the presence of Flavonoids. Thin layer chromatography shows the presence of 3 important compound Kaempferol, quercetin and Lutein. A compound similar to flavonoids 2,3-dihydro-3,5-dihydroxy-6-methyl-4H-pyran-4-one is revealed in the GC-MS study. Leaf of Limonia acidissima shows that it has the highest antioxidant potential as compared to other plant parts. The IC50 value is reported to be 50.03µg /ml by DPPH assay. Lipid peroxidation LPO activity exhibited that leaf of the L. acidisssima has a value of 6.045 ± 0.55 µmols MDA g-1DW13. (ii) Murraya koenigii: By TLC examination three compounds were found to be present namely Kaempferol, quercitin, and luteolin. The leaf of it shows the maximum antioxidant capacity by the DPPH and Lipid peroxidation assay. The IC50 value is reported to be 49.86 µg/ml by DPPH assay. Lipid peroxidation LPO activity exhibited that leaf of the plant has a value of 23.715µmols MDA g-1DW14. (iii) Duranta erecta: The GC MS study of Duranta erecta shows the presence of 14 compounds which are common in all parts such as Benzene 1,4- diol, Trans-cinnamic acid 1,2-Benzene-dicarboxylic acid many compounds similar to flavonoids are also found such as 2H-1-Benzopytran-2-one,6,7-dimethoxy-, 2(4H)-Benzofuranone, etc. The antioxidant activity of the root extract of D. erecta measured by DPPH and peroxidize method was significantly higher than the leaf and stem The IC 50 value was reported to be 40.97µg/ml and in lipid peroxidize method leaf shows higher antioxidant potential with a value of 38 µmols MDA g-1FW 15. (iv) Petrea volubilis L.: The leaf of P. volubilis shows maximum lipid peroxidation assay with a value of 24.955 µmols MDA g -1FW, and in DPPH assay the IC50 was reported to be 36.85 µg/ml in root showing highest antioxidant potential. Studies conclude that the maximum antioxidant activity was found to be higher in the leaf of P. volubilis as compared to any other plant 16. (v) Rumex vesicarius: The methanolic extracts of R. vesicarius shows higher antioxidant activity. By DPPPH assay the leaf showed maximum antioxidant activity. Other methods such as lipid peroxidation assay, Ferric reducing ability of plasma (FRAP) assay and the peroxidase assay all showed that the leaf has higher antioxidant capacity among all parts of the particular plant. The DPPH activity shows IC50 value 174.91 ± 17.96 µg/ml. The highest reduction in the MDA level was found to be 6.48 ± 2.0 µM MDA-1DW in methanolic extract of the leaf. In the peroxidase assay maximum activity was shown by ethyl acetate extract of flower 0.07 ± 0.008 Mm min -1g-1DW 17. (vi) Sisymbrium irio: The stem of Sisymbrium irio is rich in antioxidant activity. The DPPH assay showed IC50 value to be 407.11 ± 18.09µg/ml in stem lipid peroxidation assay and the FRAP assay showed that among all parts of S. irio the stem has maximum antioxidant potential, while the peroxidase assay showed that methanolic extract of leaf of S. irio exhibited maximum peroxidase activity with a value of 0.028 ± 0.011 mMmin-1g-1DW 18. (vii) Digera muricata: The methanolic extract of stem of D. muricata when used to assess the antioxidant capacity by the method of DPPH Assay the radical scavenging percentage was found to be maximum in the stem with the value of 89.01 ± 1.23% 19. (viii) Gomphrena celosioides Mart. : The DPPH radical scavenging activity was reported to be maximum in the stem with a value of 88.04 ± 1.11% 20. (ix) Trichosanthes cucumerina: The petroleum ether extract of the leaf shows maximum DPPH radical scavenging activity with a value of 50.49 ± 0.84%. Methanolic extract of the plant showed maximum antioxidant capacity 21. (x) Melothria maderaspatana: The DPPH radical scavenging activity was reported to be maximum in leaf with a value of 40.61 ± 0.41%. Among all the plant parts leaf shows maximum antioxidant activity 22. 2. Antimicrobial Activity: Antibiotics are used to cure the microbial infections and also as chemotherapeutic agents with the belief that it eventually would eradicate all the infectious diseases. The control of infectious diseases has been remarkably effective since the discovery of antimicrobial drugs. However, some of the pathogens rapidly become resistant to many of the first discovered effective drugs. These drug-resistant pathogens are on the rise which contributes to morbidity, mortality and increased health care cost with tremendous variability, not only amongst pathogens causing various clinical infections in different geographic regions but also ever a time in specific areas. Asia Pacific region has been the area with the highest levels of antimicrobial resistance amongst the five global regions studied. Many infectious diseases are known to be treated with herbal remedies throughout the history of mankind. These are the leading cause of death worldwide. Antibiotic resistance has become a global concern. The clinical efficacy of many existing antibiotics is being threatened by the emergence of multidrug-resistant pathogens. The use of plant extracts and phytochemicals, both with known antimicrobial properties, are of great significance to treatment. Antimicrobial activity of various herbs and spices in plant leaves, flowers, stem, roots, and fruits has been carried out by various investigators in different solvent extracts. In Rumex vesicarius studies revealed that acetone, pet ether and benzene extracts were most effective against fungi and acetone against bacterial strains while methanolic and aqueous extracts were least effective. Flower fraction shows maximum antimicrobial activity against P. funiculosum (DIZ30 mm, MIC 25 mg/ml), the petroleum ether extract of leaf exhibited maximum antimicrobial activity against P. funiculosum (DIZ 30 mm, MIC 12.5 mg/ml) and bacteria E. coli (DIZ 20 mm, MIC 25 mg/ml). Crude alkaloid extract shows the highest fungal activity against P. funiculosum and E. coli23. (i) Sisymbrium irio: Benzene extract of flower, leaf, and stem shows maximum activity against fungus A. niger (DIZ 20 mm, MIC 6.25 mg/ml) and F. oxysporum (DIZ 22 mm, MIC 12.5 mg/ml). The petroleum extract shows activity against E. coli, P. aeruginosa (DIZ 20 mm, MIC 12.5 mg/ml) 18. (ii) Duranta erecta: The antimicrobial activity of extracts in different solvents of the selected plant was carried out by disc diffusion, well diffusion and broth dilution. The results showed that methanolic extract of the stem has a potent activity against A. flavus, P. chrysogenum, and Rhizopus spp. The root extract of the plant shows activity against P. chrysogenum 15. (iii) Gomphrena celosioides: The stem part was found to show maximum activity against E. coli may be due to the presence of phytosterols. Various extracts show potential activity against A. flavus, F. oxysporum. The methanolic extract shoes the maximum activity against A. flavus and A. fumigatus with an inhibition zone of 17 mm and 18mm 24. (iv) Petrea volubilis: Root shows antimicrobial capacity among all part parts it has activity against fungus P. funicolosum DIZ 16 mm MIC 12.5 mg/ml while the leaf and root against bacteria D. subtilis DIZ 25 mm MIC 3.13 mg/ml and against S. aureus DIZ 16 mm 16. (v) Melothria maderaspatana: The petroleum ether extracts of leaf and fruit of M. maderaspatana shows the highest activity against T. reesai, and F. oxysporum DIZ 16 mm and the fruit has maximum potential against S. aureus and E. coli DIZ 10 mm, the ethyl acetate extract activity was maximum against P. funiculosum 25. (vi) Trichosanthes cucumerina: The fruit part shows Maximum activity against P. funiculosum and S. aureus DIZ 16 mm at 50 mg/ml. The leaf extract shows that it has moderate activity against bacteria such as P. aeruginosa, S. aureus, E. coli and B. subtilis 25. (vii) Limonia acidissima: In antibacterial assay crude extract of flavonoids of leaf part exhibited strong and similar inhibition activity against S. aureus, B. subtilis DIZ 14 mm and the fruit part shows activity against T. ressei DIZ 14 mm. BACTEC TM MicroMGIT TM Assays showed that Mycobacterium tuberculosis was sensitive to methanol extracts of leaf GU-9 while resistant to fruit extracts 13. (viii) Murraya koenigii: Among all the parts leaf extract exhibited highest activity against bacteria E. coli DIZ 15 mm, MIC 25 mg/ml and against fungus T. ressei Diz 18 mm MIC 6.25 mg/ml. Maximum antifungal activity was found in leaf extract against P. funiculosum DIZ 14 mm MIC 25 mg/ml at 50 mg/ml. The phytosterol alkaloid extracts of the plant parts also showed potential activity against microbes. BACTECTM MicroMGITTM Assays showed that Mycobacterium tuberculosis was sensitive to methanol extracts of leaf GU-9 while resistant to fruit extracts 26. (ix) Sida acuta Burm f.: Flavonoids from the different plant parts were found to possess antifungal activity against Candida albicans 27. 3. Anti-diabetic Activity: DM (Diabetes mellitus) is a metabolic disorder characterized by chronic hyperglycemia or increased blood glucose level with the disturbance in carbohydrate metabolism resulting from absolute or relative lack of insulin secretion. The frequency of this disorder is on the rise globally and is likely to hit 300 million by 2025. In India projected to have the largest number of diabetic cases. There are two forms of diabetes- Type I (Insulin dependent) and Type II (Insulin-independent) diabetes. Type I diabetes is caused due to insulin insufficiency because of lack of functional beta cells. Patients suffering from Type I are therefore totally dependent on the exogenous source of insulin while patients suffering from Type II diabetes (insulin independent) are unable to respond to insulin and can be treated with dietary changes, exercise, and medications. The most prevalent form both in the global and Indian scenario is the non-insulin dependent diabetes mellitus which is associated with elevated postprandial hyperglycemia. Pancreatic alpha-amylase is a key enzyme in the digestive system and catalyzes initial step in the hydrolysis of starch to maltose and finally to glucose. Degradation of this dietary starch proceeds rapidly and leads to elevated postprandial hyperglycemia (PPHG). It has been shown that the activity of human pancreatic amylase in the small intestine correlates to an increase in postprandial glucose levels, the control of which is, therefore, an important aspect in the treatment of diabetes. Hence, retardation of starch digestion by inhibition of enzymes such as alpha-amylase would play a key role in the control of diabetes. Alpha-amylase inhibitor plays a major role in the management of postprandial hyperglycemia. It inhibits the action of alpha-amylase enzyme leading to a reduction in starch hydrolysis to maltose and consequentially lowers postprandial hyper-glycemia. Inhibitors which are currently in clinical use (acarbose, miglitol, and voglibose) are known to inhibit a wide range of glycosidases such as beta glycosidase and alpha-amylase. Other medications available for the treatment of Type II diabetes are biguanides, sulphonylureas, thiazolidinediones but they have exhibited a number of undesired side effects. Therefore, the search for more safer, specific and effective hypoglycemic has continued to be an important area of investigation with natural extracts readily available from traditional medicinal plants offering great potential for discovery of new anti-diabetic drugs. (i) T. cucumerina: Alpha-amylase inhibitory activity of different extracts of the fruit of T. cucumerina showed 25.23 ± 0.38% to 36.74 ± .59%, 40.47 ± 0.66% to 63.74 ± 1.14%, 43.49 ± .72% to 52.22 ± 0.48% inhibition at the concentration of 0.3 to 1.5 mg/ml in methanol, flavonoids, steroids and alkaloids respectively. IC50 values of methanol, flavonoid, steroids and alkaloids extract were 209.36 µg/ml, 40.77 µg/ml, 74.61 µg/ml and 135.77 µg/ml respectively. The fruit and leaf part of the plant are a good source of flavonoids so these parts have significant α-amylase activity showing their anti-diabetic potential 25. (ii) Melothria maderaspatana: Percent inhibition activity of alpha-amylase by steroids and Alkaloids sample of the leaf of Melothria maderaspatana was evaluated. The IC50 value was calculated in the studies to be 65.10 µg/ml and 74.12 µg/ml. Steroids extracted shows significant antidiabetic potential from stem and flavonoids extracted from the fruit and leaf showed the highest inhibitory activity IC50 value was reported to be 61.42 µg/ml 25. (iii) Aloe vera L.: Percent inhibition activity of alpha-amylase by different extracts of leaves of Aloe vera L. were evaluated and both flavonoids and alkaloids were found to show alpha-amylase inhibitory activity by showing 55.83 ± 0.12 to 57.70 ± 0.09 and 7.36 ± 0.10 to 17.34 ± 0.10 percent inhibition with IC50 value of 0.0002 mg/ml and 0.032 mg/ml respectively 28. (iv) Azadirachta indica A Juss. : Alpha-amylase inhibitory activity of flavonoids and alkaloids extracts of leaves of Azadirachta indica A Juss. Showed 42.06 ± 0.3 to 46.85 ± 0.13 and 15.60 ± 0.11 to 19.69 ± 0.09 at the concentration of 0.3 mg/ml to 1.5 mg/ml respectively. IC50 values were found to be 0.009 mg/ml and 16.66 mg/ml for flavonoids and alkaloids respectively. Results revealed the higher antidiabetic potential of flavonoids and lesser antidiabetic activity of alkaloids of the plant 29. (v) Allium cepa L.: Flavonoids and alkaloids extracts of bulbs of Allium cepa L. showed 45.12 ± 0.16% to 47.83 ± 0.11% inhibition of alpha-amylase at concentration of 0.3 to 1.5 mg/ml with an IC50 value of 5.37 mg/ml and 10.12 ± 0.11% to 16.37 ± 0.10% inhibition of alpha-amylase with 346.73 mg/ml respectively 30. (vi) Allium sativum L.: Alpha-amylase inhibitory activity of flavonoids and alkaloids extracts of bulbs of Allium sativum L. showed 56.22 ± 0.20% to 58.33 ± 0.20% with an IC50 value of 0.15 mg/ml and 10.22 ± 0.06 to 20.12 ± 0.10 with an IC50 value of 85.11 mg/ml respectively 30. (vii) Mangifera indica L.: Flavonoids and alkaloids of stem bark of Mangifera indica L. showed 55.15 ± 0.14% to 55.5 ± 0.14% with an IC50 value of and 1.29 ± 0.10% to 17.86 ± 0.13% with an IC50 value of 0.021 mg/ml and 3.168 mg/ml respectively 31. (viii) Andrographis paniculata Nees: Flavonoids of the whole plant, leaf, and root of the plant were found to have goof alpha-amylase inhibitory activity with an IC50 value of 0.2 mg/ml, 0.004 mg/ml and 0.017 mg/ml respectively 32. (ix) Vitex negundo Linn. : Flavonoids of root, stem, root, and flowers were evaluated for their alpha-amylase inhibitory potential and were found to possess the activity with IC50 values of 1445.43 mg/ml, 0.08 mg/ml, 0.8 mg/ml and 0.5 mg/ml respectively 32. CONCLUSION: From the perspective of evolutionary pharmacology, secondary metabolites represent a fascinating library of bioactive compounds with a broad activity towards human cells, bacteria, fungi, viruses, and parasites. This review article is focused on in-vitro methods of evaluation of antioxidant, antidiabetic and antimicrobial activity of secondary metabolites. It was prepared based on a plenty literature search. Presently flavonoids, alkaloids, and steroids from different plants were found to possess biological activity. So, this article will be a comprehensive ready reference for those who are interested in antioxidant, antidiabetic and antimicrobial of secondary metabolites. ACKNOWLEDGEMENT: Authors are thankful to the Head, Department of Botany, University of Rajasthan, Jaipur, India for providing all facilities for the present investigation. Special thanks to University Grant Commission, New Delhi for financial assistance. Ali H: An investigation of antimicrobial compounds for immunomodulating and antiadhesion Immunology and infectious disease and research laboratory, Ph.D. thesis 2003; 01-186. Chopra and Ananda S: Āyurveda In Selin, Helaine. Medicine across cultures: history and practice of medicine in non-western cultures. Norwell, A: Kluwer Academic Publishers 2003; 75-83. Gibbons S: An overview of plant extracts as potential therapeutics. Expert Opinion on Therapeutic Patents 2003; 13(4): 489-497. Dwivedi, Girish, Dwivedi, and Shridhar: Clinician- Teacher par Excellence. Indian J Chest Diseases Allied Sci (Delhi, India: Vallabhbhai Patel Chest Institute, U. of Delhi/National College of Chest Physicians) 2007; 49: 243-44. Britto SJ and Senthilkumar S: Antibacterial activity of Solanum incanum leaf extracts. Asian J Microbiol Biotech Env Sci 2001; 3(1-2): 65-66. Rao RS and Ravishankar GA: Plant cell cultures: Chemical factories of secondary metabolites. Biotechnol Adv 2002; 20: 101-153. Santosh MK, Sharanabasappa GK, Shaila D, Seetharam YN and Sanjeevarao I: Phytochemical studies on Bauhinia racemosa, Bauhinia purpurea Linn. and Hardwickia binate Roxb. E-Journal of Chemistry 2007; 4: 21-31. Weisshaar B and Jenkines G: Phenylpropanoid biosynthesis and its regulation. Curr Opinion Plant Biol 1998; 1: 251-257. Okunade AL, Elwin-Lewis MPF and Lewis WH: Phytochemistry 2004; 65: 1017-1032. Mills S and Bone K: Principles and Practice of Phytotherapy–Modern Herbal Medicine. New York: Churchill Livingstone 2000; 31-34. Ju YH, Clausen LM, Alrd KF, Almada AL and Helferich WG: β-sterol, β-sitosterol glucoside and a mixture of β-sitosterol and β-sitosterol glucoside modulate the growth of estrogen-responsive breast cancer cells in vitro and ovariectomized athymic mice. Journal of Nutrition 2004; 134: 1145-1151. Tiwari R and Rana CS: Plant secondary metabolites: a review. International journal of engineering research and general science 2015; 3(5): 661-670. Vijayvargia P and Vijayvergia R: A Review on Limonia acidissima: Multipotential medicinal plant. Int J Pharm Sci Rev Res 2014; 28(1): 191-195. Vijayvargia P and Vijayvergia R: Assesment of phytochemicals and antioxidant activity of Murraya koenigii International Journal of Pharmaceutical Sciences and Research 2016; 7(5): 2163-67. Sharma P, Khandelwal S, Singh T and Vijayvergia R: Phytochemical analysis and antifungal potential of Duranta erecta against some phytopathogenic fungi. 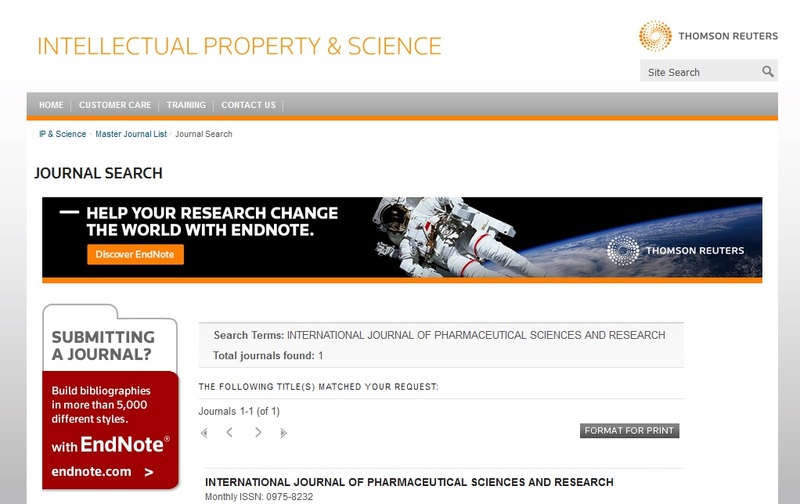 International Journal of Pharmaceutical Science and Research 2012; 3(8): 2686-2689. Sharma P: Isolation and identification of bioactive compounds from some medicinal plants of Verbenaceae. D. thesis; Department of Botany, University of Rajasthan, Jaipur 2015. Shah A, Sharma P and Vijayvergia R: Antimicrobial properties of different solvents extract of Rumex vesicarius on some selected bacterial and fungal isolates. International Journal of Pharma Sciences and Research 2015; 6(3): 1107-1114. Shah A: Evaluation of phytochemicals and their antimicrobial properties of Sisymbrium irio and Rumex vesicarius Linn. Ph.D. thesis, Department of Botany, University of Rajasthan, Jaipur 2015. Sharma N and Vijayvergia R: A Review on Digera muricata Mart. - A Great Versatile Medicinal Plant. Int J Pharm Sci Rev Res 2013; 20(1): 114-119. Sharma N: Identification and bioefficacy of bioactive from some medicinal plants of family Amaranthaceae. D. thesis, Department of Botany, University of Rajasthan, Jaipur 2014. Choudhary S, Tanwer BS and Vijayvergia R: Total phenolic, flavonoids and antioxidant activity of Trichosanthes cucumerina Drug Invention Today 2012; 4(5): 368-370. Choudhary S, Tanwer BS, Singh T and Vijayvergia R: Total phenolic, total flavonoid content and the DPPH free radical scavenging activity of Melothria maderaspatana Cogn. International Journal of Pharmacy and Pharmaceutical Sciences 2013; 5(1): 296-298. Shah A, Singh T and Vijayvergia R: In-vitro antioxidant properties and total phenolic and flavonoid contents of Rumex vesicuis International Journal of Pharmacy and Pharmaceutical Sciences 2015; 7(7) 81-84. Chaudhary S: Isolation and characterization of bioactive compounds of Melothria maderasptarnia and Trichosanthes cucumerina Linn. Ph.D. thesis, Department of Botany, University of Rajasthan, Jaipur 2016. Vijayvergiya P: Studies on some medicinal medicinal plants of Rutaceae as a natural source for bioactive compounds. D. thesis; Department of Botany, University of Rajasthan, Jaipur 2016. Alka J, Padma K and Chitra J: Antifungal activity of flavonoids of Sida acuta Burm f. against Candida albicans. International Journal of Drug Development and Research 2016; 4(3): 92-96. Jain C, Kumar P and Singh A: Hypoglycemic activity of flavonoids and alkaloids extracted from Aloe vera in two districts of Rajasthan: A comparative study. 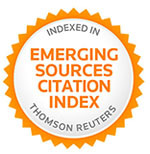 Elixir International Journal 2013; 62: 17877-17879. Chitra J, Padma K, Archana S and Alka J: In-vitro comparisons of anti-diabetic activity of flavonoids and crude extracts of Azadirachta indica A Juss. International Journal of Drug Development and Research 2013; 5(1): 47-54. Jain C: Comparative study of selected anti-diabetic plants in Jaipur and Bharatpur districts of Rajasthan. D. thesis; Department of Botany, University of Rajasthan, Jaipur 2015. Jain C, Singh A, Kumar P and Gautam K: Anti-diabetic potential of flavonoids and other crude extracts of stem bark of Mangifera indica Linn: a comparative study. Journal of Scientific and Innovative Research 2014; 3(1): 21-27. Gautam K, Kumar P and Jain C: Comparative study of alpha-amylase inhibitory activity of flavonoids of Vitex negundo Linn. and Andrographis paniculata Nees. Inter-national Journal of Green Pharmacy 2013; 7(1): 25-28. Jain C, Khatana S and Vijayvergia R: Bioactivity of secondary metabolites of various plants: a review. Int J Pharm Sci & Res 2019; 10(2): 494-04. doi: 10.13040/IJPSR.0975-8232.10(2).494-04. Authors Address: Department of Botany, University of Rajasthan, Jaipur, Rajasthan, India.